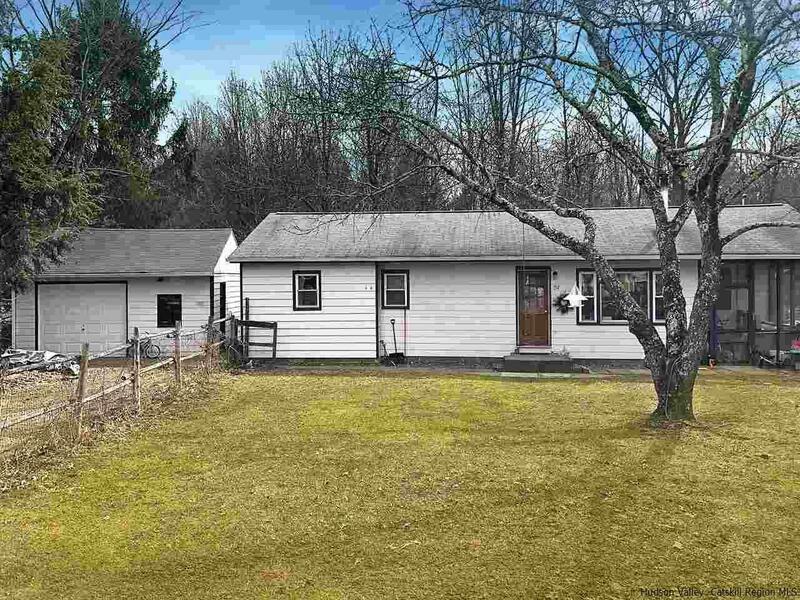 Set on a nice lot in a convenient Rosendale location, this charming ranch home offers space, privacy and easy access to everything you need. Inside, there are three bedrooms and living space for everyone to enjoy. An eat-in kitchen features a server window that connects through to the living room. Here, a wood stove creates a cozy ambiance throughout the winter. There is scope to add your own touches and turn this humble abode into a lovely property with a designer kitchen or you can simply move in and enjoy this home as it is. There is a large, private rear yard with pretty wooded views. There are raised organic garden beds for your fresh veggies along with raspberry bushes and grape vines. With plenty of room for a pool or extensions, you can make your backyard dreams come true. You will love to live only moments from the Trailways Bus service, while shopping, dining and school services are just a short drive away. Quick drive to New Paltz, Kingston, Poughkeepsie, hiking, swimming, climbing, wineries and breweries. Walk to the Rail Trail and the Rosendale train trestle.